An obscure but sometimes important point about bond strength: you noted tensile strength and shear strength; it should be expanded to be reasonably complete to include peel strength, the strength of adherence between the glue and the substrate (which differs in some important ways from tensile strength). I have no experience with the high gws hide glues you refer to in today\’s post, but I would suspect from a measure of experience in adhesive technology that the shrinkage related glue line failures you describe may, in some cases, be a loss of substrate adhesion by exceeding the peel strength of the bond. 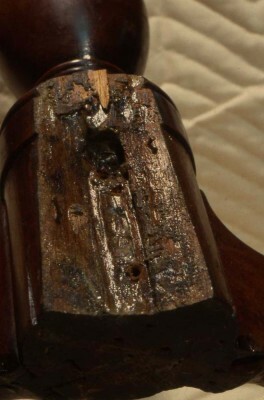 This would be signaled by bare, intact substrate surface areas that would not be consistent with a pure tensile failure of the glue or tensile failure of the substrate itself. Perhaps you\’ve seen enough of such failure to know. I certainly don\’t. James is of course correct and I was remiss in not incorporating this major glue failure mechanism. If the glue line is too thick and the glue gws too high (thus rendering the glue too full of water for the particular application), as the glue dries and shrinks it will sometimes peel away from contact with the adherend. And yes, James, I have seen this in effect. Any time you see glue failure and the putative surfaces are glossy like this, the culprit is likely the shrinkage of the glue line causing it to withdraw from the adherend. It is almost the dispositive evidence of peel strength failure due to shrinkage.